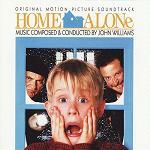 In 1990, John Williams composed one of his most popular and enduring classics, Home Alone, and in so doing changed the face of Christmas soundtracks for years to come. Chris Columbus' family megahit made a star of young Macaulay Culkin as Kevin McAllister, the smart-aleck kid who’s unwittingly left high and dry by his family when they jet off to Paris. Foiling the attention of two dim-witted burglars, Harry and Marv (Joe Pesci and Daniel Stern), Kevin eventually learns the true value of family in the classic tradition. Accompanying Culkin's exploits every step of the way is Williams' score, a delightful, carefully orchestrated and winningly melodic treat resplendent in the warm Festive tones of the season. The Main Title introduces the mischievous woodwind/celesta-based theme perfect for sneaking around and discovering hidden Christmas presents. The main theme itself comes in the latter half of the track, the carol "Somewhere in my Memory" (penned specifically for the film by Williams and Lesley Bricusse), getting a lovely representation on both orchestra and vocals. 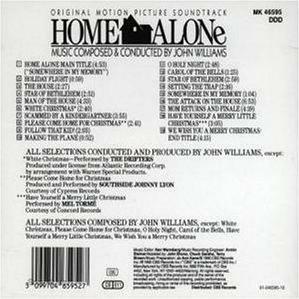 Both themes are reprised regularly throughout, getting notably wintry renditions in "The House" and others when accompanied by sleigh bells and chimes. The thematic content is in fact astonishingly rich for a family film. There is fast paced "action" in "Holiday Flight" (which should surely be the anthem for Heathrow's Terminal 5), full of whirling strings as Kevin's family rush to make their ill-fated trip; "Star of Bethlehem", an anthemic theme celebrating the spirit of the season; and "Man of the House", after beginning with more sparkling action music, introduces the villains' theme for the first time, a infectiously daft piece for bassoons and base woodwind. Williams makes the wise choice of lightening the tone and making the baddies seem even sillier through his clever micky-mousing. All of the above weaves its way through a sumptuous package but Williams isn't even halfway done yet, presenting a more overtly gothic motif on bells for the neighbourhood bogeyman, Marley (Roberts Blossom), not to mention further heavenly vocal performances for both the "Star of Bethlehem" and "Somewhere in My Memory" themes. "Setting the Trap" adds a terrific soft rock beat to the glimmering Christmas soundscape as Kevin plots to turn the tables on Harry and Marv – it really shouldn't work but Williams pulls it off with his usual mythical panache. "The Attack on the House" is the lengthiest cue, weaving the burglars' and main themes round each other carefully during the film's most famous sequence, as the vaguely bratty Culkin inflicts numerous agonies on Pesci and Stern. Building to surprisingly dark proportions in the latter stages, of course as well all know, Kevin is rescued by an unlikely saviour and Williams mirrors the surge of joy in his glorious "Finale", when his family return to him. "Somewhere in My Memory" here gains a marvellous, redemptive sheen for full orchestra, prior to the wonderful "End Title" suite full of the joy of Christmas. Here is our piano arrangement of Carol Of The Bells.